Since I'm trying to put to the back of my mind the fact that we now have no dessert for our Christmas dinner (a disastrous early preparation session this afternoon, bloody, bloody Delia) and that I shall probably have nightmares after a real 'hack' job in trying to de-head the turkey (I'm all for knowing where your meat comes from, that's why I buy from the farm... I would just rather they did the dirty work), I interupt this panic session to take a seasonal photo tour of the flat. Mum and D are arriving tomorrow lunchtime, so this is the last time it'll look tidy for a while! I bought the mistletoe and holly from a couple who regularly set up at the top of Rue de Vesle. The guy asked me how much I wanted to pay (it's Christmas and I'm a pretty lady, apparently!) which completely threw me. As I told him, I have no idea! He suggested €2 - 3, so with Christmas spirit and a sense of guilt, I handed over €5. A good business trick - though I don't think it'd work out that postively if I tried it out on my freelance clients. ... now spot the swedish christmas horses that were a gift from a friend last year (thank you Jonas!) they now guard the christmas cards and oranges by the fireplace. ... pause to admire the old battered bookcase that I've cursed over the last couple of days, as I worked on reviving it with a couple of coats of cream paint, expertly multi-tasking, whilst watching The West Wing DVDs borrowed from the library. ... and to the final, second fireplace in the dining room, my New York mirror, decorated with the stars I bought for my first Christmas in Manhattan. This is our first Christmas in Reims, nearly eighteen months after we moved in. We've been setting up the flat, little by little (there's some irony in the fact that when we first moved in, I had no time but a healthy salary and now lots of time and a limited income!) and there's a warm feeling to be had from seeing my home looking festive. I have a couple hours of peace, whilst Frog freezes at the Stade de Reims. You'll find me on the sofa, digging into a tub of maltesers and enjoying the quiet! So, here is the plan. Christmas Eve will be spent at the Frog Family home, enjoying a French style celebration. I know that the menu will include their traditional oysters; foie gras; roast something, that's not turkey and a buche de Noël (christmas log), . The 25th will see the Frenchies joining my family at our flat. The idea was a traditional English Christmas lunch served as a dinner. I find it highly amusing that just before Christmas, Mum usually takes off, with her friends, on a 24 hour hop across the channel to stock up on cheaper French delicacies that can be found in northern, industrial France's hypermarchés. This year, she will be crossing the channel with shopping bags filled with English items that are difficult to find in France, including single and double cream; paxo stuffing; crackers; stilton; extra large turkey foil; parsnips and home made Christmas pudding. I am now struggling to sort out the starter in our English menu. We'll just have one starter (Frog Mother provides two) and I think something smoked salmony would fit the bill. I was thinking smoked salmon with mini blinis, créme fraiche and lumpfish (i.e. cheap, pretend caviar). Easy to assemble, tasty and not too expensive. The problem is that when I mentioned this to Frog, he got all French and said "well maybe with some asparagus and little cherry tomatoes..."
What think Frog is forgetting, is that our English main course is so much heavier than a French one. In fact, when we eat this at the correct lunch hour (2pm), we can't usually face pudding until the evening. I think my solution is correct but I don't want the French getting sniffy. I've been spending the last few days working on a freelance project. Whilst being really happy to have some work, and that this is quite an interesting assignment, it has sent me down an odd little emotional tunnel (again!). I'm working for the first time on pharmaceutical marketing - looking specifically at secondary breast cancer support for patients and carers. Yes, a real mood lifter! So, I've stopped dreaming about deformed babies and am now dreaming about having reunions with family members, past and present, who are cancer sufferers. I'm just spellchecking the document this afternoon, so hope to bill them and quickly move onto more joyful times! I'm pretty ready for Christmas now. Just a couple more gifts to buy and then I hope to do some baking and preparation for when the hoardes descend. Well, Mum and D anyway. We'll be going to Frog Family's house for Christmas Eve feasting and then there will be a return visit with eight of us around the table for a more English style Christmas Day meal. It'll be my first time doing turkey and the works and I'm hoping that Delia will be a reliable guide. The seating plan will need some engineering to ensure everybody has at least one person next to them who can speak their language. Once I've worked out what to serve as a starter, I'll post the menu. 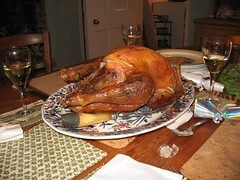 The 7kg turkey is ordered from a local farm in the Ardennes and will need collecting on Friday. I came to the conclusion last night that I have, quite probably, married into a family that is more messed up than my own. At least with my paternal family I've gone through several decades of working out which relationships I can manage, and which will just have to shut up and make do without me. The issue, I have now discovered, with in-laws is that you don't have that freedom. I just have to continue in my passive-aggressive way, screaming when we're safely home and I'm in a calming, relaxing bath, chanting a mantra, 'It's their problem. Not mine. They're unhappy people. I am not'. After several days of muttering (I don't really want to travel... I don't want to be left alone for a weekend... I want to see my Mum.... I don't want her to have to drive over from England...) Saturday morning found me sat on the Eurostar with Frog on our way across to London. He had a long standing meeting with an importer and I had planned on staying home, putting my feet up and taking it easy in my first trimester. Well, since my part of the plan had fallen apart, I had finally decided to head to London. Whilst Frog opted for his planned weekend with his mates, I made my way down to Peckham to meet Mum and squat in my sister and boyfriend's house whilst they took off for a four week Christmas break in the southern hempisphere. Watching a month's worth of QI episodes recorded on Sky Plus. Managing to not completely lose it when sat in a pub surrounded by hundreds of screaming babies and children. My hunger overcame any other natural instinct. Walking along the South Bank and feeling like a tourist taking photos. Visiting St Paul's for the first time, after spending years passing it on the #8 bus. Walking into the Tate Modern and realising that the new "Slides" installation was not a series of colour images but real "wheeeeeee" slides. The look on Frog's face, just for that split second, when I told him that I had nearly texted him to tell him I was leaving him for "another man". Sitting in a pub in Peckham, eating a Sunday roast with Mum and realising that my best friend from home from the ages of 11 - 13 years, who I hadn't seen since she left Wimborne and moved to Norwich with her family, was sitting at the table next to us. Eating a coconut pyramid, just like my Grandma used to make, with my large latte whilst waiting for a friend in Covent Garden. Having lunch in my friend's very cool member's bar and (whilst being very pleased to see her and remembering that I used to work in this industry) being more cheesily impressed when I realised that Strictly Come Dancing is filmed in the studios there. Meeting a grumpy Frog back at Eurostar on Monday afternoon, who had turned up to his meeting and found that his importer was off with the flu. Alright that last one wasn't a highlight of the weekend but the reason we both went to London never happened and yet we both had a much needed escape. I came back with a renewed energy, I have now cleaned our once neglected flat to a sparkling level and feel ready to take on Christmas! 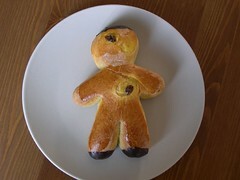 I had this little brioche Saint Nicholas with a milky coffee for breakfast on my birthday last week. One of his currant eyes seems to have slipped but he tasted delicious, nonetheless. My birthday, as my American friends would say, sucked big time. I had had an early scan the day before to check the progress of a new 7 week pregnancy. The results weren't good and so I spent last Friday anticipating my second miscarriage in the space of three months. The good news is that it has been less physically traumatic than the last one. The bad news is... the bad news. So, no birthday trip to Paris, no concert, no James, a cancelled highway code test and so on and so forth. I'd like to write a deep and meaningful post, but the truth is I'm a bit numb to it all at the moment. I shall, instead, retreat back to my favoured position of lying on the sofa watching DVDs.